The White House is becoming occupied! Glazing to the raggedy 'ruin' edge and it's 'Eyrie' are installed. Interior works make great progress and the sedum starts to flower. The scaffolding is (almost) all down. The steel stair is installed in the 'ruin' building. Enclosing the link between the 'ruin' building and the 'new' build, with a frameless glass wall and south facing glazed sliding panels. The first windows go in and the west wing stone wall is complete. Working on the west wall in a cold winter. 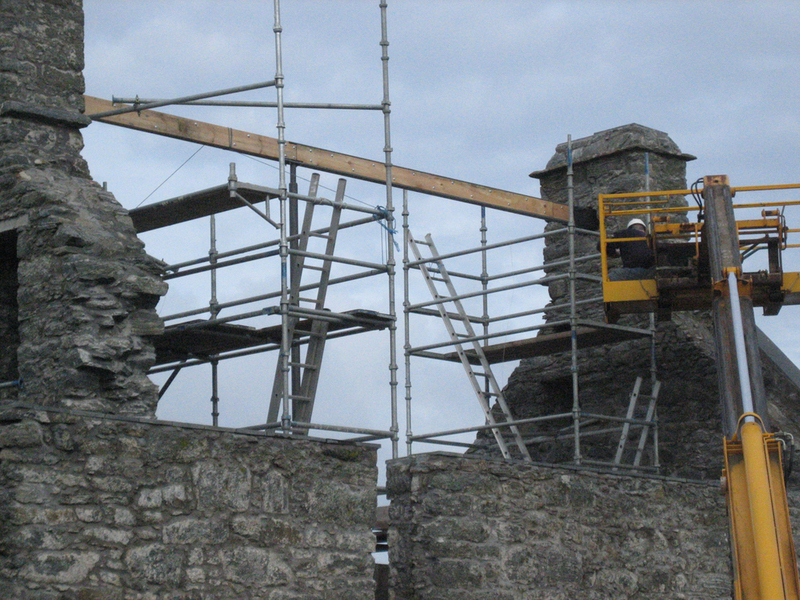 The masons start work on the west wall, despite the very wet weather. Completion of the slating and views from the interior spaces are forming. The ridge beam for the roof in the original ruin is put in place. A lone steel column supports it in the middle. The beam is a composite of steel and timber. The original roof structure didn't have a ridge beam and this may have been one of the reasons why the external walls were so violently pushed out and cracked when the original roof collapsed. The roofing membrane is now on the new west wing. A bit of weatherproof shelter is particularly welcome for Spey Joinery after an August of continuous rain! The main structure inside the ruin is now up. The main framing structure is largely in place. This photo shows the 'tooth'/'turret' sticking through the main roof. This will house a small study with windows looking in three directions. The section where the new structures slot into the existing ruin is very complex, particularly as there is a big movement joint across the whole house here. The whole area has had to be detailed to avoid cracks appearing in random places! You can see the top of the new west wing where there will be a window seat. The eyrie window before the small floor under it is installed. The small and cosy future study is also shown. The aspect of the building that is closest to the form of the original building. This will be the main entrance facade. 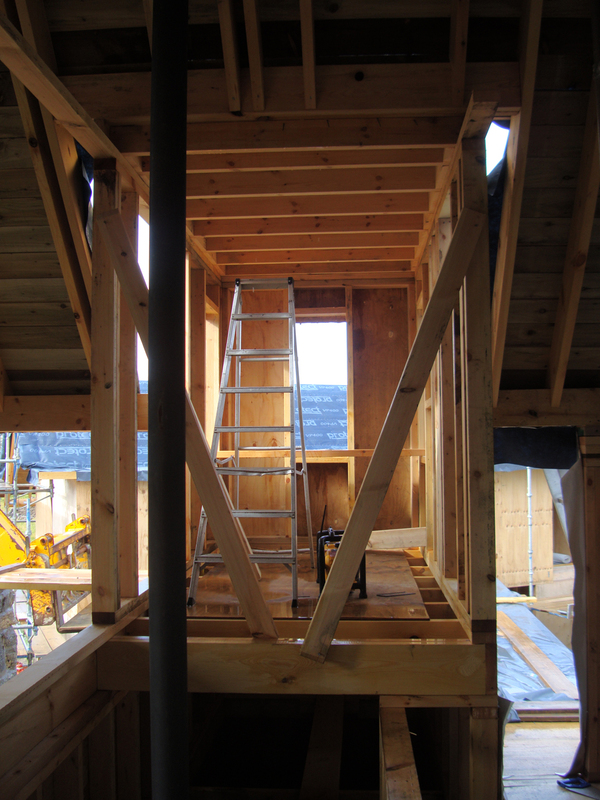 Originally the front door would have been at first floor level and accessed by timber stair. The Tele-handler saves many trips up and down ladders. The open walls here will be glazed. Spey are working off this flat roof to build up the blockwork around the study 'tooth'. The timber frame goes up and the roof goes on. Constructing the 'new' west wing as the ground floor steelwork and timber frame are erected. Reinforcement and shuttering for the raft foundations commence. 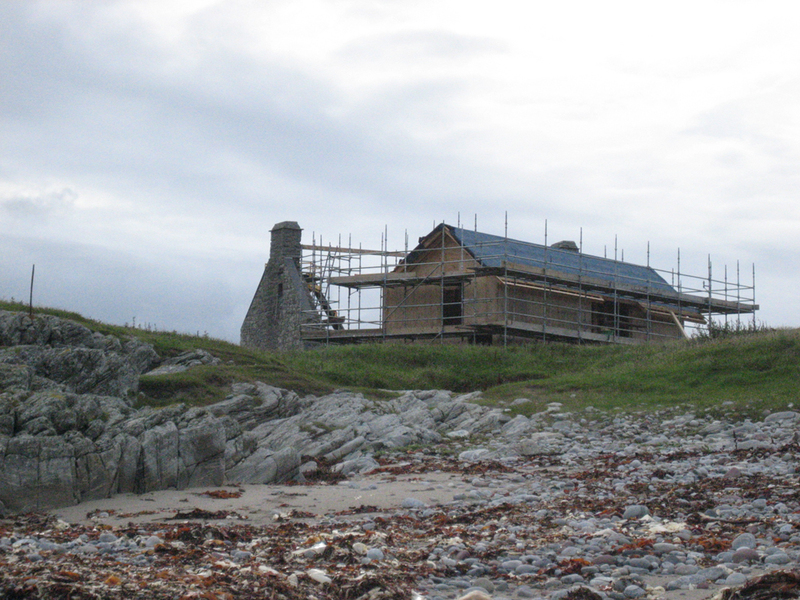 Spey Building and Joinery arrive, archeological excavations are undertaken and consolidation to the interior stone work are completed. The building is ready for the new concrete slabs to be poured. 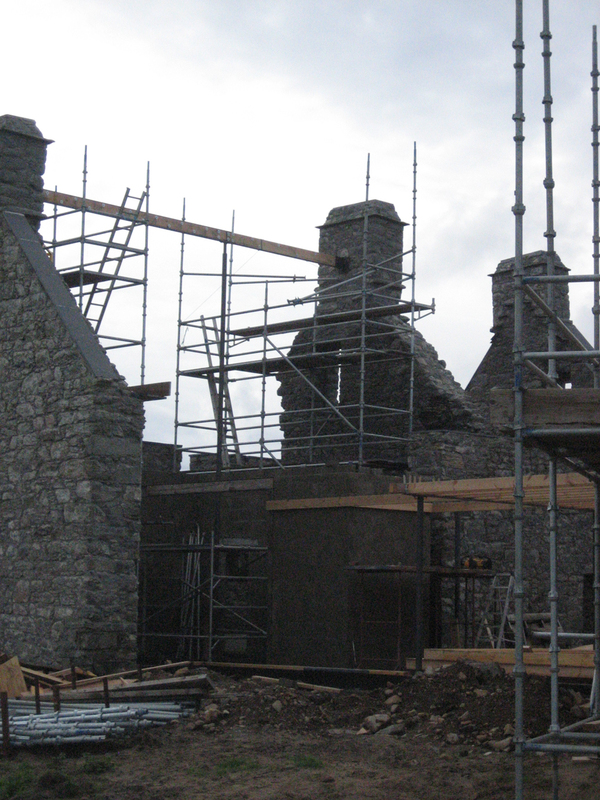 Bad weather instigates inside work for the stone masons. The opening is completed and ready for the new link. Copings to the existing walls. Making room for the new construction and reclaiming the stone.